The Forgotten Objects. After few mysteries, here we are today with a new game that will bring you a bit into reality. Cleaning the house is something rarely someone really enjoys. OK, there are the housewives that are very happy when they get all cleaned up and enjoy the moment. But, for the most part of women, cleaning is a huge every day obligation that gives us a heartache. Well, someone will say, you can pay a cleaning service and no more headaches. But, not everyone can afford that, isn’t it? When you live together with someone, no matter if it is only a partner or a wife, maybe splitting the obligations is the best way to save some money. Each of them can do some cleaning thing and the job will be done. Samuel and Doris are spouses. They decide that it is time to clean up the guest house together with the garage that is part of it. For a long time no one uses this house for living. On the contrary, Doris uses it as a larder for some objects that she doesn’t need at certain time. But, this house needs extra hands. To succeed the mission, they need help from their friends. During the process of cleaning, they find a lot of forgotten objects that they can use today. 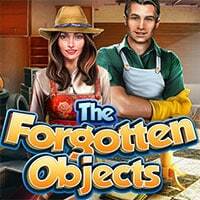 The Forgotten Objects is a free online hidden object game on Hidden4Fun.